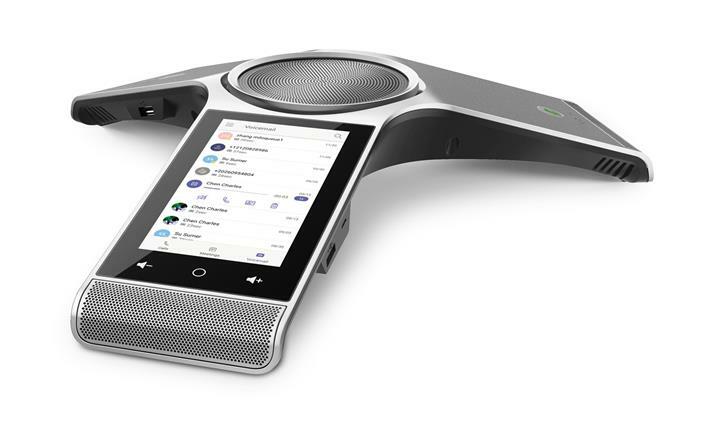 An enterprise-grade conference phone with a 20-feet (6-meter) and 360° voice pickup range and noise proof technology, ideal for both huddle and large conference rooms. The CP960 conference phone combines hardware and software, including Yealink Noise Proof Technology, to fully enhance its audio quality. Thanks to its built-in 3-microphone array, the CP960 has a 20-feet (6-meter), 360° voice pickup range, making it an ideal solution for any conference room that needs the best audio experience. Participants will feel like they are sitting across the table from each other. In addition, the Yealink CP960 provides scalability for long audio-capture distances at a radius of up to 65 feet (20 meters). The 5-inch multi-touch screen and the Skype-and-Teams-tailored interface provide for a rich visual presentation and easy menu navigation. The CP960 is fully compatible with the Skype for Business and Teams key calling functionality, making for a holistic and effective ecosystem for team-based environments. When using Skype for Business on your PC or a mobile phone, you can route a call to the CP960 via the USB port or Bluetooth pairing to join a conference call.